What's the mark on faces of Hare Krishna devotees? Devotees of Krishna decorate their bodies with markings called tilaka. Tilaka is generally made by mixing gopi chandan—a type of Indian clay—with water, and applied with the ring finger and/or with wooden stamps. The forehead marking is the most visible, but devotees place similar marks in thirteen places—on the arms, chest, neck, and back—while reciting mantras, prayers to Krishna for protection. As devotees of sports teams often decorate themselves with their team's colors and insignias to remind themselves and others of the glories of their team, Krishna devotees wear tilaka as a reminder that we are all sparks of living spiritual energy within material bodies. Tilaka is meant to designate the body as a temple of the spirit within, marking it as the property of the Supreme Person, Krishna, meant to be utilized in His service. Krishna Himself decorates His own face with tilaka; so anyone who sees the tilaka marking on the forehead of Krishna devotees is reminded of Krishna—either consciously or subconsciously. - A further exploration of the reasons for wearing Vaishnava tilaka. "When putting the twelve tilaka marks on the twelve places of the body, one has to chant the mantra consisting of these twelve Vishnu names. After daily worship, when one anoints the different parts of the body with water, these names should be chanted as one touches each part of the body." "Every devotee should take his bath early in the morning and decorate his body with tilaka. . . the twelve tilaka marks on the body are sufficient as auspicious decorations to purify the body." 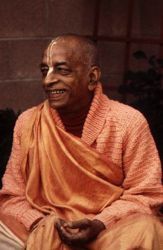 "We have practical experience of this with our students in the International Society for Krishna Consciousness. . . When they are dressed with saffron-colored cloth, with tilaka on their foreheads and beads in their hands and on their necks, they look exactly as if they have come directly from Vaikuntha." "Sri Chaitanya Mahprabhu then marked His body with tilaka made from the mud of Radha-kunda, and with the help of Balabhadra Bhattacharya, He collected some of the mud and took it with Him." "The word darshaniya-tilaka in Text 10 indicates not only that the Lord is "the most excellent (to see)," but also that He decorated Himself with attractive reddish tilaka taken from the mineral rich earth of Vrindavan forest." Why do Krishna devotees shave their heads and wear tilak? Why do Krishna devotees wear tilaka?